Kraut, R. E. & Resnick, P. (2012). Building successful online communities: Evidence-based social design. Cambridge, MA: MIT Press,. Prepublication drafts are available on the book page. Order from Amazon. Yang, D., Yao, Z., Seering, J., & Kraut, R. E. (2019). The Channel Matters: Self-disclosure, Reciprocity and Social Support in Online Cancer Support Groups. Proceedings of the ACM on Human-Computer Interaction - CSCW, 3(Nov). [pdf] Best paper honorable mention. Zhu, H., Dow, S., Kraut, R., & Kittur, A. (2014). Reviewing versus doing: Learning and performance in crowd assessment CSCW'14: Proceedings of the ACM Conference on Computer Supported Cooperative Work & Social Computing (pp. 1445-1455). NY: ACM. Dabbish, L., Kraut, R. E., & Patton, J. (2012).Communication and commitment in an online game team. CHI'12: Proceedings of the ACM Conference on Human Factors in Computing Systems. NY: ACM. Dabbish, L., Kraut, R. E., Farzan, R., & Postmes, T. (2012). Fresh Faces in the Crowd: Turnover, Identity, and Commitment in Online Groups. CSCW'2012: Proceedings of the ACM Conference on Computer Supported Cooperative Work. NY: ACM. Kittur, A., Khamkar, S., André, P., & Kraut, R. E. (2012). CrowdWeaver: Visually managing complex crowd work. CSCW'2012: Proceedings of the ACM Conference on Computer Supported Cooperative Work. NY: ACM Press. Forte, A., Kittur, N., Larco, V., Zhu, H., Bruckman, A., & Kraut, R. E. (2012). Coordination and beyond: Social functions of groups in open content production CSCW'2012: Proceedings of the ACM Conference on Computer Supported Cooperative Work. NY: ACM Press. Shklovski, I., Burke, M., Kiesler, S., & Kraut, R. (2010). Technology adoption and use in the aftermath of Hurricane Katrina in New Orleans. American Behavioral Scientist, 53(8), 1228-1246 [PDF]. Subrahmanyam, K., Kraut, R. E., Greenfield, P., & Gross, E. (2000). New forms of electronic media: Impact of interactive games and the Internet on cognition, socialization, and behavior. In D. Singer & J. Singer (Eds.,) Handbook of Children and the Media. Pp. 73-99. Los Angeles, CA: Sage. 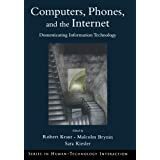 Kiesler, S., Kraut, R., Lundmark, V., Scherlis, W., & Mukhopadhyay, T. (1997, March 24-27) Usability, help desk calls, and residential Internet usage. Proceedings of the CHI '97 Conference (Atlanta, GA,), New York: ACM. Kraut, R. E. (1996, Dec.). The Internet@Home: Introduction to the special section on the new home computing. Communications of the ACM. Yu, L., Kraut, R. E., & Kittur, A. (2016). Encouraging Outside-the-box Thinking in Crowd Innovation Through Identifying Domains of Expertise. CSCW'16: Proceedings of the ACM Conference on Computer-Supported Cooperative Work and Social Computing. NY: ACM Press. [pdf]Yu, L., Kittur, A., & Kraut, R. E. (2014). Distributed analogical idea generation: Inventing with crowds. CHI'14: Proceedings of the ACM Conference on Human Factors in Computing Systems. NY: ACM. Best paper honorable mention. André, P., Kraut, R. E., & Kittur, A. (2014). Effects of simultaneous and sequential work structures on distributed collaborative interdependent task CHI'14: Proceedings of the ACM Conference on Human Factors in Computing Systems. NY: ACM. Hsieh, G., Kraut, R. E., Hudson, S. E., & Weber, R. (2008). Can Markets Help? : Applying Market Mechanisms to Improve Synchronous Communication CSCW'8: Proceedings of the ACM Conference on Computer-Supported Cooperative Work. New York: ACM Press [PDF]. Galegher, J. & Kraut, R. E. (1994). Computer-mediated communication for intellectual teamwork: An experiment in group writing. Information Systems Research.5(2), 110-138. Kraut, R. E., Galegher, J., Fish, R. S., & Chalfonte, B. (1993). Task requirements and media choice in collaborative writing. Human-Computer Interaction. 7(4), 375-408. Kraut, R., Galegher, J., & Egido, C. (1990). Informal communication and scientific work. In J. Galegher, R. E. Kraut & C. Egido (Eds. ), Intellectual teamwork: Social and technological bases for cooperative work. Hillsdale, NJ: Lawrence Erlbaum Associates. Kraut, R.E. & Fish, R.S. (1995). Prospects for video telephony. Telecommunications Policy, 19 (9), 699-719. Kraut, R. E. (1989). Telecommuting: The trade-offs of home work. Journal of Communication, 39, 19-47. Kraut, R., Galegher, J., & Egido, C. (1988). Tasks and relationships in scientific research collaborations. Human-Computer Interaction, 3, 31-58. Steinfield, C., Caby, L., Jaeger, C., & Kraut, R. (1998). Electronic network use and coordination between producers and suppliers: A French and US comparative analysis. In E. Bohlin & S. Levin (Eds. ), Telecommunications transformation: Technology, strategy, and policy. Amsterdam: IOS Press. Lucas, H. C., Levecq, H., Kraut, R. & Streeter, L. (1995, November). France's grass-roots data net. IEEE Spectrum, 71-77.